PLEASE SUPPORT OUR AMAZING @STEEMITBLOGGERS COMMUNITY WITH YOUR DPOLL VOTE TO WIN THE 20K DELEGATIONsteemCreated with Sketch. The @theycallmedan 20k Delegation Dpoll is live! Voted. But it's a secret, lol. I'll be supporting you guys again. Still flirting with joining your. I even lurked in the application discord last night. I don't know maybe 3 upvotes a day is overwhleming my vp. I am just not ready. I wish there was a light version. If everything in life was easy to get then it would become so boring, leaving aside excitement and struggle. Everyone has to show some dedication which is keypoint to be successful on this very platform and sometimes you have to get beyond your individual capacity. Just saying this on lighter note, no offence intended. You have some very good advice. I just don't know if I can provide as much devotion as I should to be a full member. I am still excited to exploring all the unique corners of Steem. Maybe when you guys win this or I feel like settling down, I will change my mind. For now I like to be a #steemitbloggers-lite, #powerhousecreatives-lite member. Hey there! I have to jump in with @bluemist and give you a little nudge to push you over the edge. ;) I was a bit tentative when I first started toying with the idea of joining the group, as well. I'm definitely a full-fledged introvert, so forced interaction doesn't sit well with me. However, once I finally took the plunge I realized it's not hard to interact with so many truly genuine, creative people. Once you get in the routine, it really isn't hard to do your daily support--if anything I wish I had time some days to do more! You don't have to vote all of your support at 100% either, so if you are able to use the slider to adjust your percentage if you feel the need. No pressure to join, I just wanted to put my 2 cents out there so you can perhaps get a little inside view. It really is a fantastic group of people, and I am so happy I finally set aside my reservations and joined. Thank you for the support regardless! Thanks so much for your insight. Your average group's members are all way above average steem bloggers. Definitely good people. Convincing and devoted too. I'll throw in an application next new members round after the deligation contest. Maybe in the meantime I'll be a pretend tagless member. I probably upvote and comment at least 1 member a day without trying. I am sure If I follow a few more members 3 or more won't be an issue. Hey, you mentioned wishing there was a light version. I understand the struggle... especially as it relates to VP. We have an incredibly generous community however. One of our members offers a 30 day delegation specifically for those struggling with VP. I took advantage of it when I was below 100 and it helped me immensely! It is nice to hear different perspectives. When I first joined and was under 100 sp I had no interest in blogging, just info. The market was too heated and I had no experience with blogging. I guess you could say I got help from naive investors. This community seems a lot more rewarding and helpful than just an upvote circle. Generally there are two reasons people join blogs or investing and speculating, now with dapps maybe a few more reasons, Steem Monsters anyone? I have no doubt Steem will rise with the market and increase rank too. Mostly because of onboarding people who aren't necessarily interested in cryptocurrencies before getting started. Already voted and now resteemed this post. Let's get it! & We're currently on top ((: Let's go POWERHOUSECREATIVES! Fantastic!!! Thank you for the support - it is GREATLY appreciated ! Resteemed! And let's see if we can't also carry the energy through to the ongoing twitter campaign... keep the momentum going! 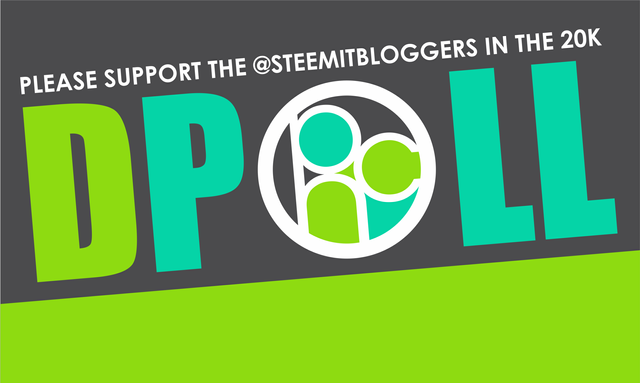 To anyone reading this: Please keep in mind that @steemitbloggers is an extensive community support organization that reaches well beyond just its own membership! Yes definitely!!! I have every intention of doing JUST that! Thank you for the support @denmarkguy! MWAH! Done my duty, now off to spread the word to others! Resteemed :) Will get on writing about it later. Meanwhile, you who read this, think about supporting the supportive community @steemitbloggers is. It goes around and everybody is a winner. Actually I am ALWAYS tired!!! hahaha shhhhh don't tell anyone! lol - and don't under-sell yourself! You do a LOT for all of us! AWESOME!!! Thank you!!!! Really appreciate it! @steemitbloggers Voted! Resteemed and upvoted this post! Let's pray that we can do it this time! You are a legend! Thank you!!!! :D And yes.... LET'S!!!! Voted on you here and dpoll. ;) also resteemed. Yeeessss! Time to get down to business! There were so many great things that came out of the last poll with communities coming together and just general positive vibes flowing all around. Can't wait to see what comes from this one! Let's go @steemitbloggers! Sending you some energy @jaynie, because I know you're going to be running at full tilt yet again!